I am tired of the constant creaking and loosening of my stock cranks on my Monocog. I replaced the BB a couple years ago with a shimano sq taper. I think the bb is fine, but the crank arms keep coming loose and are getting a little old. Those of you who have used both square taper and external bb's, is there any reason to stick with the square taper? Which requires the least amount of fiddling to keep operating smoothly? Which is the easiest to service? If external is the way to go, what are some of the better crankset/bb options for around $100? I've been looking at the Truvativ Stylo 1.1 and the Shimano LX converted to single ring. Are there any other options I'm overlooking? I already have a Salsa 32t ring so it doesn't have to be a SS specific set. One reason to stick to square taper would be BB bearing longevity. I haven't had any problems with my external bearing setup though...I've got them on 4 bikes right now. The other reason would be if you really, really wanted a White Industries Eno crankset. I'd get the LX. When the BB wears out, either press in Enduro bearings, or get something like a King, Hope, or Phil Wood external bearing BB for it. Cool, thanks for the response! So what is it that makes the external bearings have less longevity? I have not had problems with my external set ups at all. Between road or mtb's actually. Both have worked fine for extended periods of time. I got Truvative Blaze w/ bb that has maybe 40 miles on it I will sell for $55 shipped! But seriously, you can pick up a used XT or XTR crank for around $100-130 if you look long enough, then you just need a bb for it. I love my XTR's and have had no problems with them. I saw your cranks in the other thread. Really nice! I like the blacked out look. Yes, I am finding out just how much time can be consumed searching the web for deals. No doubt. I paid a little more for mine ($165) but that was because I did not know any better. 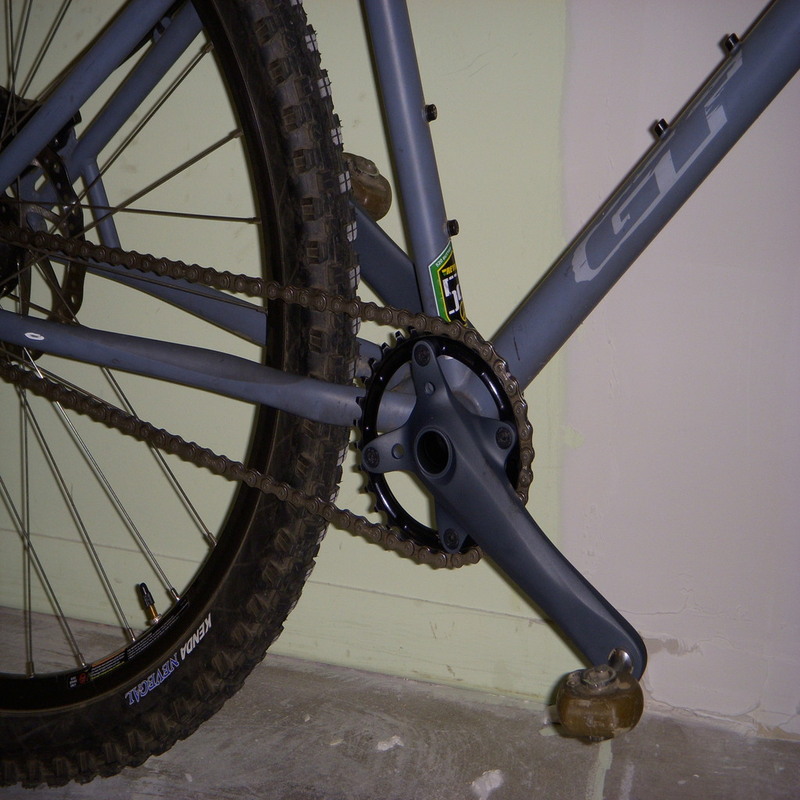 I then paid another $150 to get them modded (further than when I got them-obviously coated but also had the tabs filled down and rounded) and another $35 for my chainwheel (though my cranks did come with a 32t stock XTR ring as well as the bb). You just gotta do some searching. Granted I spent a fair amount of money but when you get the cranks back from Crazy8 they are basically a brand new crank! Just awesome. I can't say enough abut them or him for that matter! If you don't know, be forwarned that some of us might perk up with wild arguments about how square-taper is pure, better, otherwise rules and lasts longer than externals, vs. others pointing out that externals are pure, better, last longer than square-taper and otherwise rule. I have both sorts on my bikes and currently have Stylo 1.1 OCT 180's on my main SS. I've found them to be durable, good cranks that are "light for the money". Like all externals, they're easy to install and maintain, including rebuilding of the bearings (although I haven't had to do this set yet). The "eBay options" for used XT and such external BB cranks that you'll convert over to SS are great. The cranks are tough, light enough and don't flex around like a square ta...er, nvm. Again, super easy to install and maintain. Of course, those White Industry ENO's are lustworthy and, by the time you spend the scratch on those, you can afford a light/ burly bottom bracket to go with them. Thanks for sharing your experience EBasil! I was hoping that this wouldn't incite riots as to which one is better, just want to get real world experience from real riders. I read recently in a different thread that there is more drag in externals vs. sq taper because of the seals or something. Has anyone experienced this, or is it just something that doesn't translate into the real world? I've been running LX's since last year and have no complaints, they may not be the lightest but neither is my overall build so it doesn't really matter. I considered the Stylo but picked up a used LX set for cheap and glad I did.....and @ $85 bucks new right now you can't really beat the price. Don't worry about that drag thing... not really legit: cartridge bearings in square taper BB's have the same seals as cartridge bearings in externals. If there's some other esoteric angle on that issue, it's sure not something you'd ever notice. Simply replacing your cranks with new square tapers is a great option if the existing BB is fine. I have built up several bikes with Sugino cranksets I scored new on eBay for about 35 dollars, 45 for one of them. They're painted black, are decently light and the set on my wife's "parts bike" singlespeed is actually as light as the XT cranks on her other SS. This might be your ticket... the stuff works. My sq taper BB is new and is 68x113. So the above listing says "Use with a 103mm square taper bottombracket for a 45mm chainline." Will these work with my BB? If so, is there anything I need to be concerned about? If not, why? Using your old BB, with the Sugino, you'll have a 49-50 mm chainle, suitable for a MTB hardtail frame. With the IRO your chainline will be only 43.5 mm, OK for a road bike, but it'll not clear the MTB chainstays. Are you intending to use a short crank, ie a 170mm length? My wife does, but then she's practically a midget at 5'3" tall. Anyway, both those cranks are 170's. I think you can get a deal on complete cranksets...check this Sugino out. Those are 175's, but there are 170's listed. The track cranks you listed are singlespeed and have too much gear for mtb uses, a 46 ring. May not be a problem, since the Sugino can take a 39T ring, with a 18/19/20T rear cog it can be used as a MTB SS. Working out the correct chainline should be the first step for SS use! Thanks for the responses. I neglected to mention this is a 95 Trek Singletrack MTB frame but I'm now using it solely for SS commuter/road use. That is why I was asking about the IRL cranks, I can make the 42t chainring work. But it sounds as though the chainline wouldn't be compatible. My original cranks are 175, but I'm pretty sure 170 will be ok for me for road use. I've made the current rear cog spacer, and can make another to adjust the cog for a straight chainline, not a problem. So it seems like the Sugino's on the ebay link will be a good match for my purpose, correct? Well, for what it's worth, I found a pair of Shimano M440 square taper crank arms in my parts bin that I forgot I replaced on my old bike. I bolted them on the other night and tried them out. They seem to be comparable weight-wise and strength-wise, and they don't creak. Yay! At least this will allow me to get some more miles out of my fairly new square taper bb. Temporary solution until I find a smoking deal on the right set of external bb cranks.